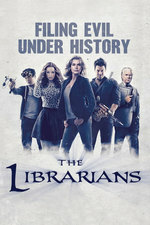 The unpleasant Cindy Kroger becomes popular via a magical love potion, and the Librarians must stop her from launching a love missile that will compel the entire world to become her fan base. I thought Ezekiel and Cindy were very cute together (setting aside the show is giving her a total pass on her crimes). Wait I'm confused. It didn't seem like Ezekiel was faking not recognizing her, because when he did finally do so it was just in front of her, so it wasn't a pretend "aha!" moment for the benefit of anyone else. So if that's the case how could his crush on her be strong enough to thwart the love potion? I was pretty bummed by that reveal because I loved the whole "I love myself and don't need anyone else to validate me" thing. It was easy to buy that Ezekiel's self-love was stronger than Flynn's & Stone's, because while yes, their egos are substantial, they've both displayed a lot of self-doubt in the past. I'm sure the answer is magic-of-TV-handwaving but this bugged me. Also, of course the reason "We're the Librarians" works is magic. I'd just always assumed it was the inherent magic of The Library (which gets completely ignored in all the "We shouldn't use magic it always has a price" conversations on the show) and not an actively-performed piece of magic. I'm going to write this off as simply being Stone's theory and not "the truth." Because Jenkins' explanation makes much more sense, is more consistent with Ezekiel's character, and he's more likely to be right than Stone anyway. Especially since Jones took "I'm an egomaniac" and turned it into "I don't need validation from others." I think that showed a good bit of maturity and self awareness from him. I think I prefer the idea that it was Ezekiel's existing crush that saved him from the potion's effect. I mean, he did recognize her from the start, just without being able to remember exactly who she was. It reminds me of how famous actors say that sometimes people who recognize their face will say things like "did we go to school together?" - like, they know they know them from somewhere, and have positive friendly feelings about them and their brain offers up things like school/summer camp/etc. So, I can buy the subliminal effect working here.